Aurora police officer Aaron Blue leaves court after testifying in James Holmes' trial at the Arapahoe County Justice Center in Centennial, Colo.,April 30, 2015. Aurora theater shooting suspect James Holmes was wearing so much protective gear when police first saw him on the night of the attack that first responders thought he was a SWAT member, police testified today. First responders told the court how they apprehended Holmes, who faces now the death penalty for killing 12 and injuring 70 others in the 2012 attack. Holmes has entered a plea of not guilty by reason of insanity, and his attorneys have admitted in court that Holmes was the one responsible for the attack but believe he was not sane at the time. Here is several officers' descriptions of the moments when they apprehended Holmes. Two of the responding officers who were the first on the scene, Jason Oviatt and Jason Sweeney, testified in court today. The first 911 calls from the theater came in to dispatch at 12:39 a.m. and police officers arrived on scene at 12:40 a.m.
Oviatt said that he saw Holmes as soon as they pulled up to the theater because he was standing by a white car by the emergency exit of theater nine, where the shooting had happened. "There was a person standing on the opposite side of the car dressed in a black tactical helmet and a gas mask. On first glance, he looked like another cop to me," said Aurora police officer Jason Oviatt. 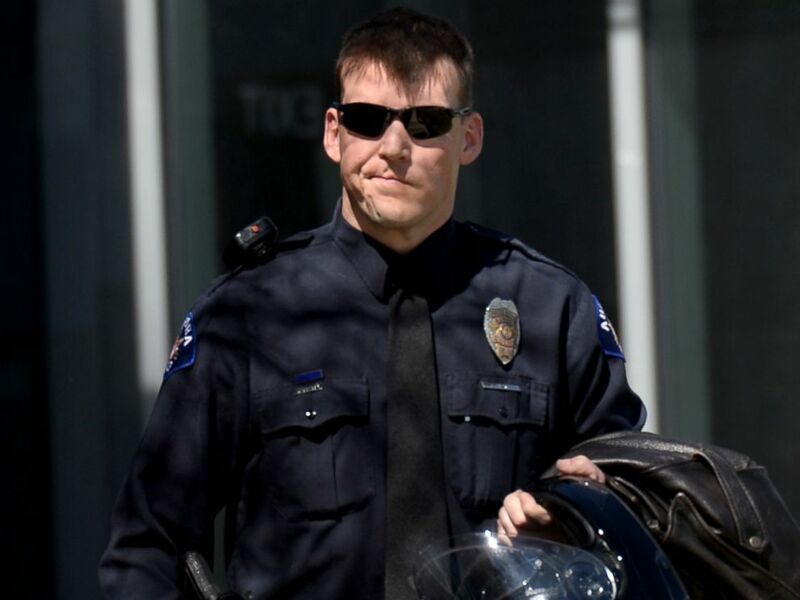 Aurora police officer Jason Oviatt leaves court after testifying in James Holmes' trial at the Arapahoe County Justice Center in Centennial, Colo., April 30, 2015. As Oviatt approached, he began to realize that the gear Holmes was wearing was not police-issued tactical gear, and when he was about 20 feet away, Oviatt began to get a sense of his demeanor which tipped him off. "The person was relaxed. That said to me he wasn’t an officer," Oviatt said. "I knew that he had to be involved in the shooting." Oviatt said that as he approached Holmes, he "pointed my gun at him." As Oviatt held Holmes at gunpoint, Officer Jason Sweeney told the court that he cleared the vehicle and ordered the suspect on the ground when he saw a plastic clamshell rifle case. Sweeney ordered Holmes to the ground and "he had his head up he was looking where we were taking him," Sweeney said in court. When they patted Holmes down through his layers of tactical gear, they found "a couple" of pocket knives and a handgun, Sweeney said. Sweeney was the one to ask him if he was alone and Holmes responded: "It's just me." 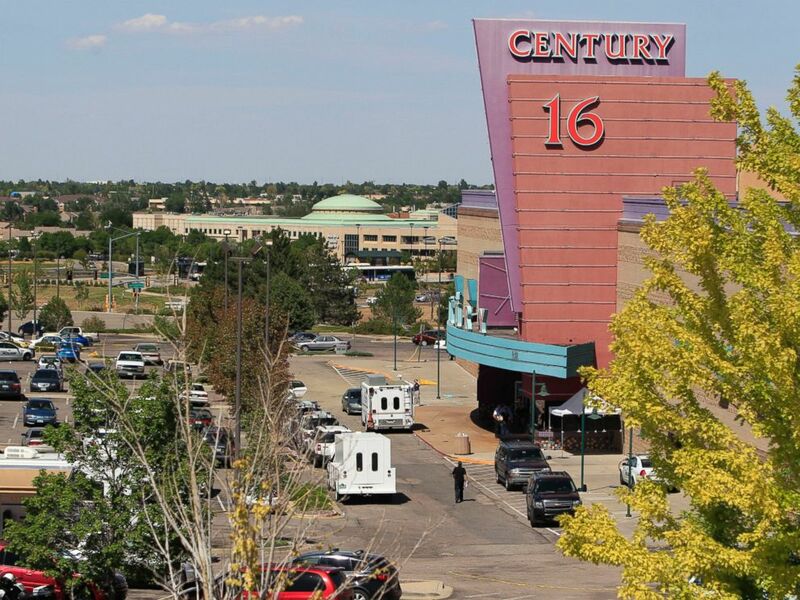 An overhead view of activities at the Century 16 theater east of the Aurora Mall in Aurora, Colo., July 20, 2012. Oviatt and Sweeney then dragged Holmes away from his car and towards a nearby dumpster where they began taking off the layers of tactical gear that he was wearing. "I made him kneel down on the ground and then cut his coat off," Oviatt said in court. "There was too much material in the coat, I was cutting with a razor but every cut I made there was more to get through it took too long." "I left him in his underwear and a torn t-shirt," he said. 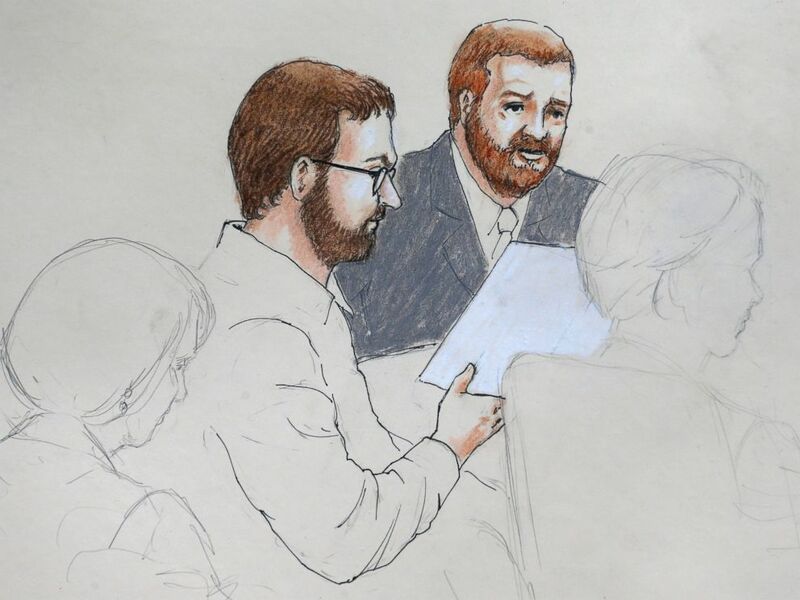 In this April 27, 2015 sketch, Aurora theater shooting defendant James Holmes, center left, and defense attorney Daniel King sit in court at the Arapahoe County Justice Center on the first day of Holmes' trial, in Centennial, Colo. The officers then put him in the back of a patrol car and strapped him in. "He was moving around quite a bit, not sitting still, appeared to be looking all around," Sgt. Stephen Redfearn told the court. "The suspect appeared to be trying to look at what was on my computer," Redfearn said. Holmes has been in court since the trial started on Monday, sitting quietly and relatively expressionless throughout.